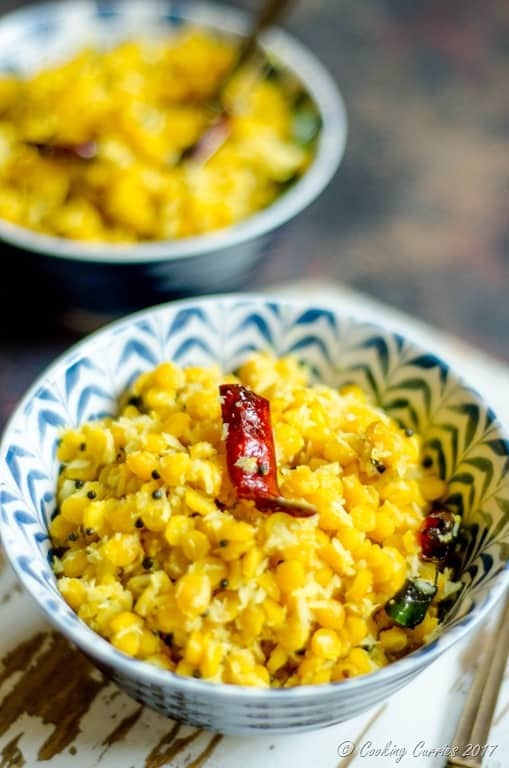 A quick yet delicious snack recipe that is vegan and gluten free, this Kadala Parippu Sundal is simple cooked yellow lentils with coconut and spices. It is a popular Southern Indian snack made during the fall festival of Navarathri. Festivals are always fun. The food is always a highlight for me, whatever the festival is. Beginning of fall is time for a lot of festivities in India, beginning with the nine day festival of Navarathri. 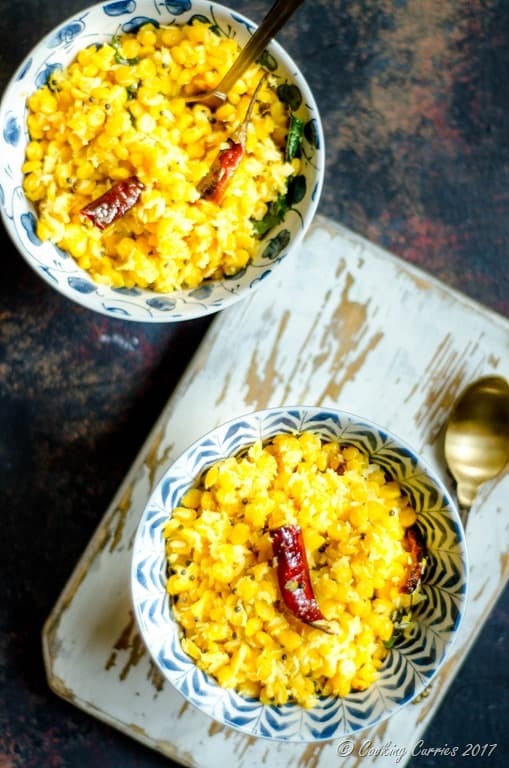 In Southern India, sundal is the most commonly prepared snack as offering during these nine days. Sundals can be made with any kind of lentils that you like. 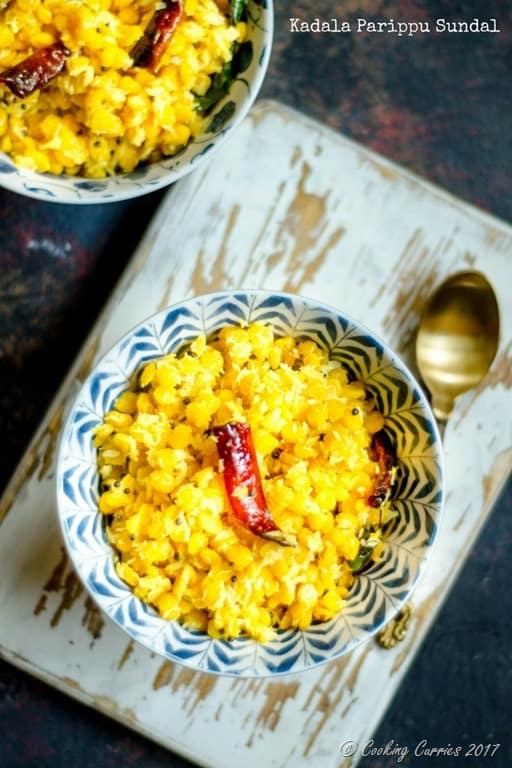 Chickpeas – both black and white, mung beans and this yellow split lentils (chana dal) are the most popular lentils to go in a sundal. But feel free to go beyond the norms and like I said, any lentils or beans will work really well in this recipe. I have made this Pinto Beans Sundal and even an edamame sundal at one time and they were delicious! Here I had to soak and cook the chana dal, but if you are using any beans that you get in cans – chickpeas or kidney beans, you can for the most part use them directly after a rinse and drain and maybe sometimes, cook in boiling water for a couple of minutes. Then heat some oil and temper mustard seeds, curry leaves, asafetida and dried red chillies in it. Add the cooked and drained beans. Some grated coconut and salt and a quick stir and you are all set! Soak the chana dal in water for 15-20 mins. Rinse and drain. 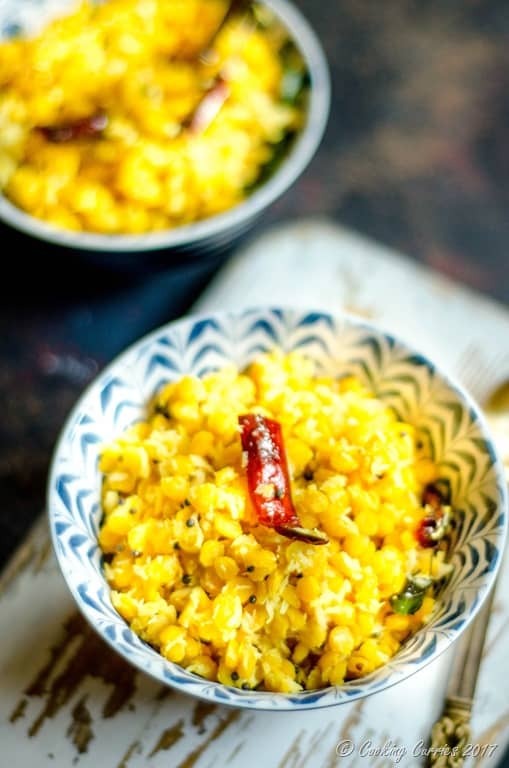 Cook the chana dal in the 3 cups of water along with the turmeric until it is cooked - should mush fairly easily when pressed between fingers but should not appear mushy. Drain and keep aside. Heat the oil in a pan and add the mustard seeds. Once they splutter, add curry leaves, dried red chillies and the asafetida. Add the cooked dal and salt and toss for a couple of minutes. Serve hot with a cup of hot chai. Always a favourite, I must try your version soon. Nice.